These are the perfect treat for the 4th of July! These tasty chocolate cookies don’t sport the typical red, white and blue flare that you might expect from a 4th of July snack but I never forget to make these the night before because if frozen – they are ideal to pack in your picnic basket before heading out to the lake, pool or park! I freeze mine in a Costco size cream cheese container in advance and grab them on our way out the door. They are delicious frozen and don’t melt into a puddle of chocolate oatmeal sauce while you play on the water. Many of my friends have asked for step by step directions for my No Bake Cookies – Enjoy! 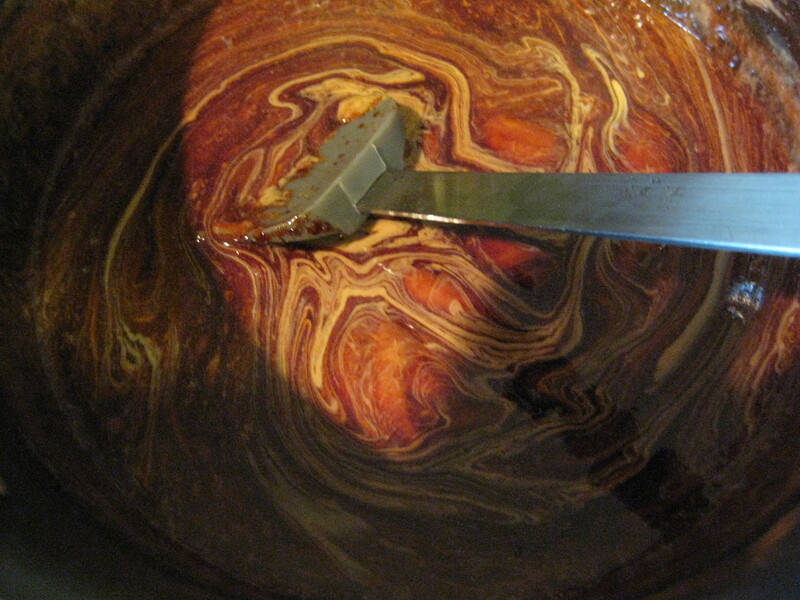 In a medium size saucepan melt 3 tbls cocoa, 2 c sugar, 1/2 c milk and 1/2 c butter. Stir occasionally until it reaches a gentle boil. Boil gently for 1 minute then remove from heat. then add 1 tsp vanilla and 1/2 c peanut butter. This step is the make or break it step! Be sure NOT to add the peanut butter while the mixture is to hot. This is the most common mistake. If the temperature is too hot, your peanut butter will break down and your cookies will not set up and remain a shiny, gooey mess. mixture is smooth and creamy. 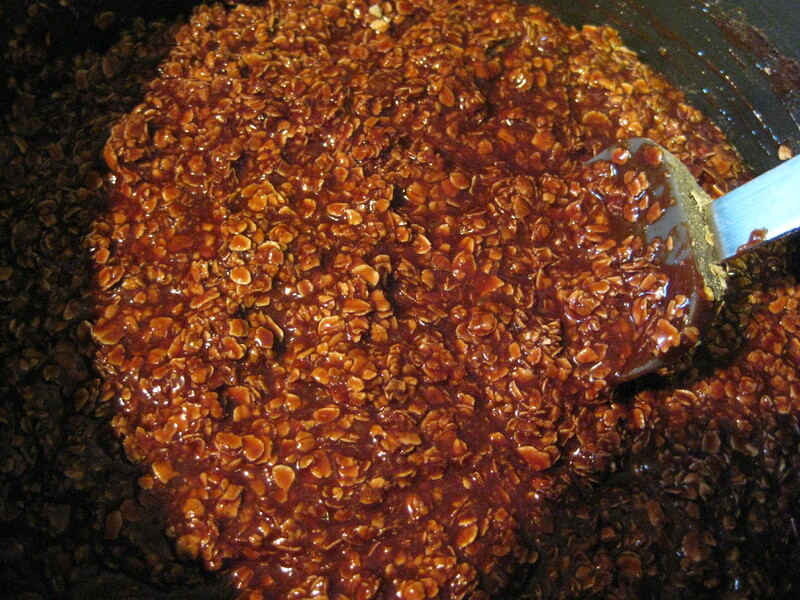 Add 3 cups Quaker Quick Oats and stir until well combined. 4) Drop by heaping tablespoon on to wax or parchment paper and allow to set for about 30 minutes. Most often I use a 1″ cookie scoop but sometimes I vary the scoop size for larger cookies all the way to a full size ice cream scoop. If you use a larger scoop, gently press the top center of the heap with the rounded underside of the scoop to flatten each one as you go. Ta-da! The perfect No Bake Cookie! Ready to eat or freeze. They freeze well up to 2 months in an airtight container. *Tip from my kitchen to yours: If you make cookies in the quantity that I do as you’ve seen in previous posts then I recommend you pre-portion your dry ingredients into ziplock baggies. In my cupboards I keep a 2 gallon ziplock that has 3 sandwich ziplock bags with the 3 c oatmeal in each one and 3 sandwich ziplock bags with the 2 c sugar and 3 tbls cocoa. All I need to do in a pinch is grab one bag of each and add the milk, butter, vanilla and peanut butter.